leaving Hatteras Village on the Outer Banks of North Carolina at dawn, heading offshore toward the Gulf Stream. 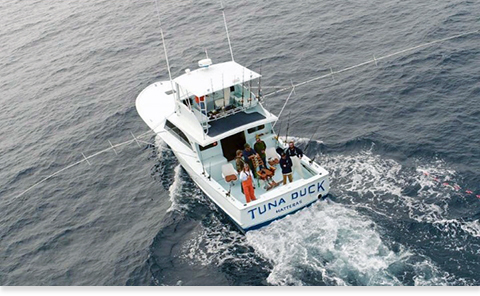 You're on a deep sea sportfishing charter aboard the Tuna Duck. 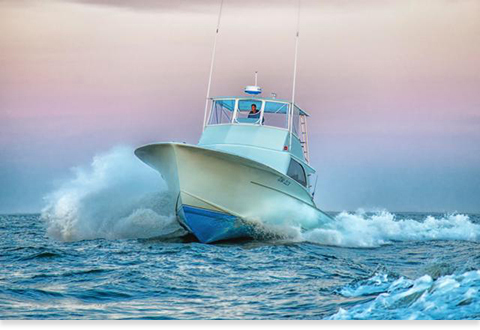 She's a 50' custom built sportfisherman, constructed especially for what she does: stalking the yellowfin and bluefin tuna, dolphin (mahi), wahoo, sailfish, and blue and white marlins that inhabit the deep blue water on the edge of the Gulf Stream. clearing Hatteras Inlet, feeling "the heave" as you head 15 to 30 miles into the ocean with your captain, Dan Rooks, who has spent his entire life on the ocean, with 30 years' experience as a captain. In an hour to an hour and a half, you will see the ocean turn from green-blue to the deep blue of the Gulf Stream and you'll put lines in the water to troll for the big ones...yellowfin and other species of tuna, dolphin (mahi), wahoo for your grill. 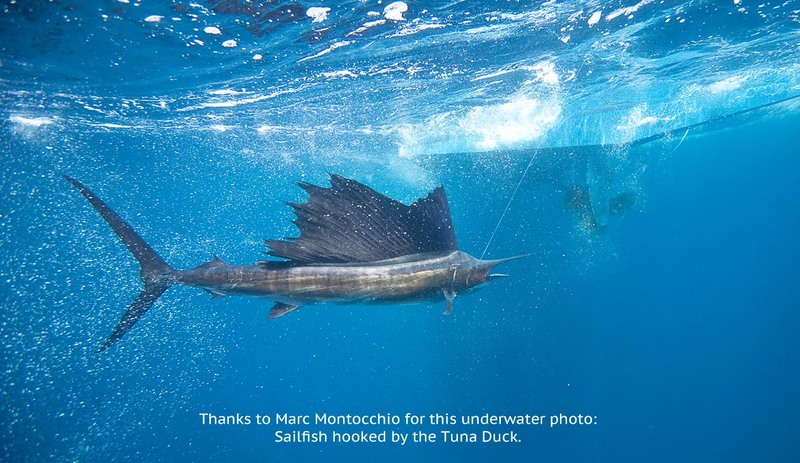 You will have a chance to catch a blue marlin, white marlin, or a sailfish and experience the thrill of a catch and release of one of these magnificent fish, returning to the dock with flags flying. having 6 to 7 hours of lines in the water time; our short run to the Gulf Stream is only 1 to 1-1/2 hours. We leave at dawn and typically return to the dock between 4 and 5 pm. All tackle and bait are furnished. We have the fishing permits needed. We operate a "Six Pack Charter;" per Coast Guart regulations, we can take from 1 to 6 passengers. Rarely, if ever, can we put people together to share the cost of a charter. Our customers make up their own parties to share the cost of the boat for the day. 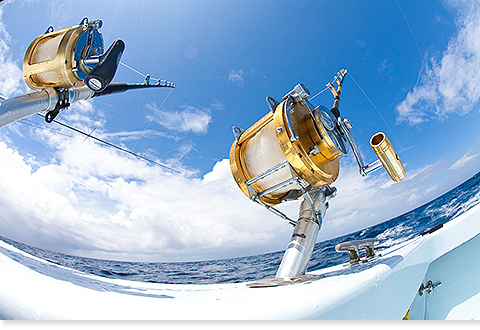 it's your deep sea fishing party mentioned here in Capt. Rooks' daily offshore fishing report, with photos, displayed here. We post a report EVERY day we fish, and have done so since 2012. So, if you want to know what we have caught in a given month or season, just go to our Daily Outer Banks Fishing Reports Page and see! 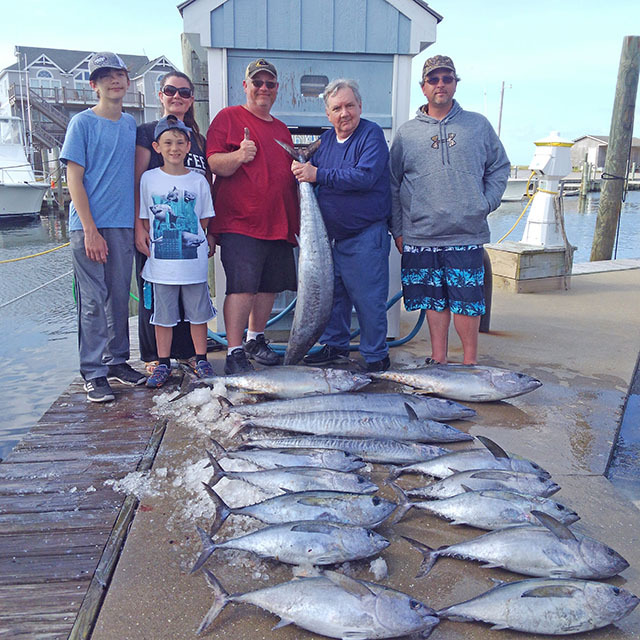 April 18, 2019 Cape Hatteras Offshore Fishing Report: Join us for excellent spring fishing! Today the weather was good and we came to the dock with yellowfin tuna, blackfin tuna, and wahoo.